Kuklos, meaning “full circle” in Greek, portrays a performer practicing alone in an empty hall. This is reflected in the work’s three sections, the first of which incorporates the performer walking into the hall and taking the instrument from its case. The piece then starts when the mouthpiece is placed, triggering a delay effect in the playback. This continues with sounds associated with an offstage warm-up, such as blowing air through the instrument, checking valves, and long notes. This all becomes intertwined with the playback track. The second section is more virtuosic and incorporates many extended techniques such as multiphonics, half-valve glissandi, flutter tongue, and singing through the instrument. This is followed by a “warm-down” section, incorporating the soloist playing a chorale before packing away his instrument and leaving the hall. The harmonic material for the solo euphonium is based on two harmonic series. The first is concert B♭ at 58.27 Hz and the second, introduced later in the piece, concert C at 65.4 Hz. For this reason, the piece can be described as spectral in its compositional style. The introduction of the harmonic series is first heard in the playback as a distant descending scale. As this moves to the foreground, it slowly starts to affect the soloist’s harmonic material. The playback part was constructed entirely from recorded euphonium sounds recorded by David Childs. The composer treated these sounds in the studio using a wide variety of manipulative software, including ring modulation, transposition, GRM, resonators, spectral inversion, and delay. 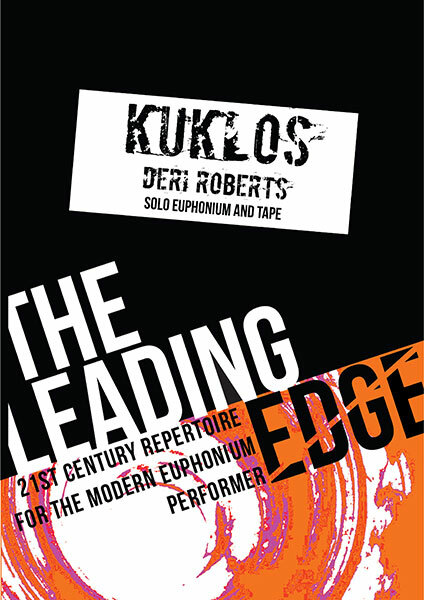 Kuklos received its first performance on 28 June 2004 at the Royal Welsh College of Music and Drama, performed by David Childs in the presence of the composer. This article was posted in New Releases, Sheet Music and tagged Deri Roberts, euphonium, Leading Edge Series, sheet music on 21 May 2015 .